Hi all. On day 11 of our tour of Morocco, many of the tour members had left us, but some of us stayed for one additional day. 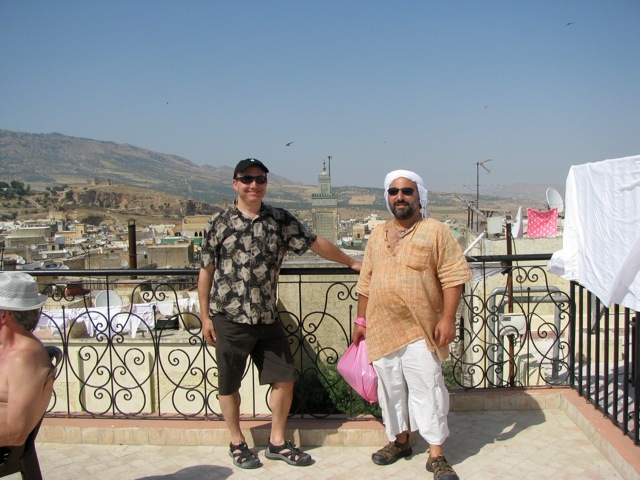 I spent the day shopping in Fes some more, once again with only a small group, and no guide. I managed to purchase a few more items (though I still never found great gifts for the kids). For lunch, Dror had befriended one of the shopkeepers, who happened to own a bed-and-breakfast in the medina (a beautifully renovated riad). He invited us to come to his bed-and-breakfast for lunch. We took him up on the offer, and had a great lunch in the garden of the riad, where we were the only people there. He joined us for lunch, and we enjoyed the food, and his company very much. We went back to the hotel for one last dinner. During this dinner, Yuval, Smadar, Maya, Dror, and Jaime played music and sang. Also, one tour member accompanied on her flute, and another on her violin. We had the entire hotel staff there as well, joining in for the music and festivities. The rest of the evening was spent enjoying each others company, as well as packing for leaving early the next morning. Since we were expecting to leave the hotel at 4am, I decided to just stay awake, rather than sleeping. When 4am came around, we all boarded the bus one last time, and it took us to the Fes airport where we caught a quick early flight to Casablanca, and, from there another flight to JFK. We arrived back in New York City Thursday evening. Goodbye Morocco. We all had a great time, and now have memories that will last a lifetime. Thanks for reading my travel blog. I’ll be uploading some of the great video I shot in the next week or so. This entry was posted by andy on Thursday, June 11th, 2009 at 7:53 pm	and is filed under Preparation. You can follow any responses to this entry through the RSS 2.0 feed. You can leave a response, or trackback from your own site.